This website is about my conures. mainly greencheek mutations, but also pearly conures and I am looking at getting another pair of a different kind of conure. My dream is to get a blue pair of greencheek conures, but right now they are way to expensive, so I am currently attempting to breed pineapple boys and girls. I also breed blue and green quaker parrots. Rose says to come in....make sure you take your shoes off first. I use standard cockatiel breeding boxes for my conures. 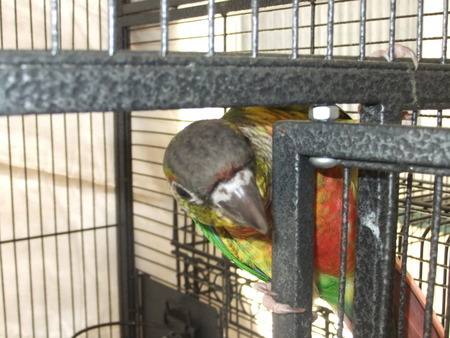 I find that they are the perfect size and so far I have had all of my conure pairs except two go down in them. There is one pair of conures that have a L shaped box, as that is what the previous breeder recommended we use for that certain pair. I handraise all of the baby conures, unless it is the pairs first year of breeding. We find that if we want to sell the young birds, it is easier to sell them if they are handraised. And we also find that if you pull the chicks at a good age the pair are likely to go down again. I prefer to raise the babies on vetafarm neocare, but if we are unable to find it, I also use Tropican.